“Beauty is not the goal of competitive sports, but high-level sports are a prime venue for the expression of human beauty. The relation is roughly that of courage to war.”_David Foster Wallace. It just worked out nicely that I would dive deep into my novel revisions during the US Open. I can’t remember what I was doing during Wimbledon so it must not have been very important. I will always remember US Open 2015 as the late summer I structured my novel revisions with the tennis matches. The matches started at 11:00 am, which gave me plenty of time to get some work done with my tea in the morning so I could reward myself with a match after. Nadal has this little tick where he pulls at the back of his shorts before he serves, prettymuch everytime. Looks like he’s constantly pulling at a wedgie. I don’t know if he knows he does it. I have little ticks in my writing. I like describing how people smell and how their mouths taste when they kiss. I also like writing about light and hearts. Heart, light. I almost always write prettymuch and everytime and everylittlebit as one word and I’m partial to em dashes and semicolons, hyphenating words that don’t necessarily need hyphenating like I’m some kind of whatever-writer. Serena, Djokovic, Nadal, they all won. 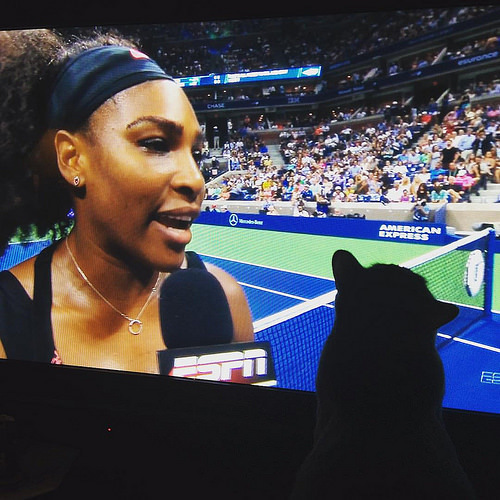 Serena is inspiring on all levels. I wrote a lot this day, added some new scenes, deleted one entire chapter that wasn’t needed, strengthened a particular relationship in my novel that I’d been thinking about a lot. I shrunk my manuscript down. It’s this method. It’s supposed to help the writer see the manuscript’s strengths and weaknesses. I think it helped me, at least it helped me see where things were happening/not happening. I shrunk it down, marked it up and laid it all out on the floor while I was watching tennis. It’s that muffled tiptiptip bouncebouncebounce of the fuzzy yellow balls that’s so comforting. I even love the rain delays because they have the quiet little machines come out and hum the courts dry. I could watch it all day, so pleasing to see the wet court, dried. I’m comforted by the players grunting or making bird-like cooing sounds as they hit the ball. It’s the crowd being so so so quiet and then getting really loud when something big happens. It’s the line judge saying Quiet Please when it’s time to get that match going again. My cat came and sat on my shrunken manuscript, she fell asleep. I sent a picture of my cat to my agent to show her how much work I was getting done. She responded by sending me a picture of her cat “helping her read” which anyone with cats knows was just a picture of her cat standing on her book. The tennis, the revising. Murray, Federer, Wawrinka, they all won. Inspired. No. 32 Foginini upset no. 8 Nadal in five sets. Again, inspired. I love watching Nadal play, he’s leonine. Foginini was a fighter and has very mesmerizing, gentle, angelic eyes. The Serena/Mattek-Sands match was AMAZING. Serena dropped the first set, Mattek-Sands had the tips of her hair dyed bright orange. It was a joy to watch, pure joy. Inspired. I brought my laptop from my bedroom to the living room to watch it on the big screen. I was nervous there for a bit because I wanted Serena to win, but I let it go…enjoyed the match…worked on my book. Forcing patience, calm. I will be pleased with myself as long as I know I’ve put up a good fight. There are so many things we can’t control. Donald Young won, which was exciting. So did Murray, Wawrinka and Federer. Federer is tennis. Federer probably smells like expensive watches and champion. I read “Federer as Religious Experience” by David Foster Wallace for the first time. Roger Federer’s backhand is so beautiful if I didn’t believe in God, I’d see it and start to wonder. There are a lot of things I feel this way about and Federer’s backhand is one of them. Ken Griffey Jr.’s swing, Buster Posey’s swing, Michael Jordan with a basketball, a Steph Curry three-pointer from the half court line—nothing but net. Peonies, orgasms, desert sunsets, babies, misting rain, chocolate cake, forgiveness, love, mercy, miracles, Ella Fitzgerald’s voice, Yo Yo Ma playing “Unaccompanied Cello Suite 1 in G Major,” Serena Williams. Everything I’m leaving out. Can beauty and perfection and good feelings exist without a creator, an organizer, some being who watches us, who went before us? I was creating/re-creating and organizing my book. This comforting, meditative video on how tennis balls are made. Cilic, Serena, Djokovic moved on. Djokovic likes to dance after he wins. He also likes to eat the Wimbledon court grass, but this is New York. This is hardcourt, this is acrylic over concrete/asphalt. Maybe I was frustrated this day, taking a break for lunch, watching a match. Maybe I didn’t feel like writing at all. Where I wanted to be: having one of those fancy gin drinks and watching a daytime match, live. We’ll get to the night matches later. Williams v. Williams, night game. Everyone was waiting for, dreading this. Serena won. I was doing most of my writing during the day. I was done for the day by the time I watched this match. I can’t remember what we had for dinner but I know it was something easy. I don’t do much else when I’m working. I enjoy cooking but not when I have work to do. My husband is a great cook. He makes really really good baked tofu and lots of other things too. Maybe we had baked tofu this night, some vegetables. I probably had a glass of Barefoot Pinot Grigio because it’s my favorite because it’s bubbly like champagne. See previous “Federer as Religious Experience” by David Foster Wallace. Federer’s wife always looks so beautiful, watching. (Same for Djokovic’s wife.) These tennis wives, draped in expensive jewelry, sitting next to the coaches. Federer probably smells like expensive wood and trophies. It’s okay to take a day off sometimes, get some rest. Federer can seem very serious so I’m glad this video exists where Federer and Nadal get the giggles and can’t stop laughing. Also, Roberta beat Serena and shushed the crowd when they tried to boo her. She was right, it was her moment, not Serena’s. The timing of this game bumped up against carpool time so I was texting my husband for updates, checking my phone at red lights. Maybe I got some writing done this day but I can’t remember. It was an emotional day for everyone. And not just because Serena lost. It was 9/11. I hadn’t sent my revisions to my agent yet. Was still sitting on them, still sleeping with them under my pillow. I half-wanted Djokovic to win because sometimes he doesn’t get the credit he deserves because Federer is so good, so popular. I half-wanted Federer to win because he hadn’t won the US Open since 2008. I all-the-way-wanted to see an amazing match. Djokovic won the US Open and I really love his celebratory fist, his responsible jawline. Federer took second place and probably still smelled like first and peppermint. I sent my revisions to my agent a couple of weeks after this match. I deleted the US Open app from my phone because it was yelling at me about my storage being almost full, but I’ll put it back next year. I hope I am working on something else next year during the US Open. I think of that Sufjan Steven’s line often when he sings “if I am alive this time next year.” I want to be. And if I am, I will surely still be seeking comfort because I am me. And I’ll remember this.